JOHANNESBURG (Reuters) - Tiger Brands has closed its factory in Pretoria where listeria was detected as South Africa faces the worst outbreak of the disease, which has killed 180 people since January 2017. The government, which has been criticised for taking too long to find the cause, linked the outbreak to a meat product known as "polony" made by Tiger's Enterprise Food in the northern city of Polokwane. 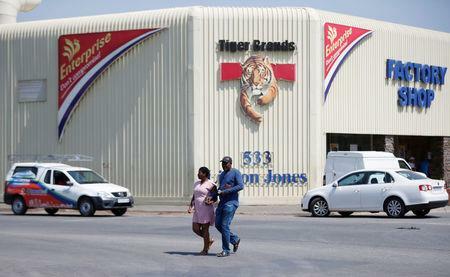 Health authorities are also examining a second Tiger Brands factory in the town of Germiston, near Johannesburg. Officials this month ordered a recall of polony made by Tiger Brands plants in Polokwane and Germiston and also by RCL Foods which has a plant under investigation by authorities. RCL Foods has said it had found no deadly strain at its plant. Tiger Brands said on Monday it recalled products made at the Pretoria facility, but added that it was not clear if the bacteria detected there were the same as the strain that has infected about 950 people since January 2017. "We will be sending samples for genome sequencing to establish the specific strain of listeria," the company said in a statement adding that the level detected was well within the range of government standards for the presence of listeria. Tiger Brand chief financial officer Noel Doyle said in an interview on Radio 702 that the company had hired international experts and was working "flat out" to find the source of the outbreak. Tiger Brands estimated it lost up to 33 million rand (2.13 million pounds) at its meat products unit in March. The food producer said it was taking a 337-377 million rand pre-tax hit due to the costs of a product recall and suspension of production at its Polokwane, Germiston, Pretoria and Clayville sites, which produce polony, and other cold meats. Tiger Brands said it has received notice of two class action suits against the firm, with the total amount claimed against the company estimated at 425 million rand. Doyle told the radio station the company had yet to calculate the total financial impact of the suits. Kenya, Zimbabwe and Zambia have banned imports of South African processed meat, dairy products, vegetables and fruit. Mozambique and Namibia halted imports of the processed meat items and Botswana said it was recalling them. Malawi stepped up screening of South African food imports. On Monday, Mozambican health authorities said they had incinerated 55 tonnes of processed meat from South Africa produced by Tiger Brands and RCL Foods. Shares in Tiger Brand closed down 1.5 percent at 350.55 rand, while RCL Foods was up 0.36 percent at 19.32 rand, against the All-Share index was little changed down 0.02 percent.